This cereal is a promising combination of "crispy" whole corn flakes and dried blueberries and blackberries that collapses into a mess when milk is added. The first thing you need to know... shake the box before you pour a bowl. The dried berries were all at the bottom of my box. When you pour milk on a bowl, you're greeted with a surprise they don't mention on the packaging. This cereal delivers a short "snap," crackle," and "pop" that would make Rice Krispies proud. The corn flakes are initially puffy and pleasantly crisp. Their flavor is somewhere between Sugar Corn Pops and Corn Nuts. Unfortunately, these flakes absorb milk at lightning-fast speed. The resulting texture after a minute in milk is a confusing combination of crunchy, chewy and near-mush. The dried berries offer a bold berry taste, with blueberry being the most dominant flavor. Like they did in the box, the berries sank beneath the flakes in my bowl. So reach that spoon down deep for spoonfuls with a little of everything. Personally, I liked the berries. But I could see some people being put off by the authenticity of the blackberry pieces. You know blackberry jam? The flavor is usually wonderful, but those little seeds can be annoying as they get stuck in the crevices of your teeth. The berries here offer the same great flavor and the same minor annoyance. The saddest thing about this cereal is that near the end of the bowl, you start to realize that there's really a good amount of berries. But by that time, the flakes have become unpleasant to eat. This cereal is better as a dry snack straight from the box. Milk is not a friend to Indigo Morning. Nutritional Considerations: Each 3/4 cup serving has 100 calories, 1 gram total fat (0 saturated and 0 trans), 22 grams total carbs, 2 grams dietary fiber, 4 grams sugar and 2 grams protein. The first three ingredients listed on the side panel are organic whole grain corn, organic evaporated cane juice and organic freeze-dried blackberries. What do you think of Indigo Morning? Flakes are good, but the fruit is really scanty. 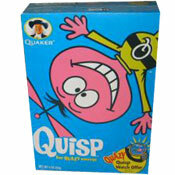 The picture on the box is totally misleading. 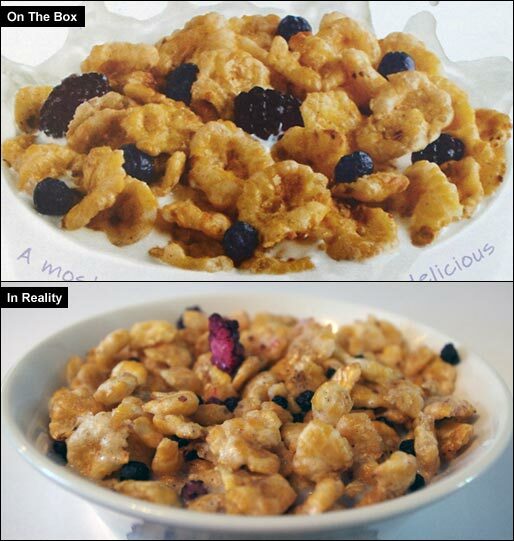 Even the "reality picture" overstates the amount of fruit. That's about the amount of fruit in the entire box. Additionally there seemed to be raspberries rather than blackberries in the box - mind I like raspberries. But I thought it was odd. I didn't find this cereal mushy at all, and I think it's super delicious without being full of sugar. 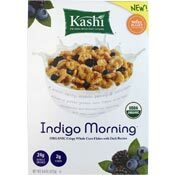 I can't agree with the review of Kashi's Indigo Morning. I like it better than any of the other cereals of this type and enjoy that it's not as sweet as many others. I don't agree with the "mushy" complaint. I could not enjoy this light crunchy cereal fast enough! It is one of my Kashi favorites after trying the first bowl - It was pleasantly crisp with almond milk and in my opinion better than Special K cereal or Rice Krispies! Taste is boring. Gets mushy too fast. Not a fan. The initial taste is great, but as time wears on the cereal in milk (I use almond milk) gets mushy and the taste is just ok.